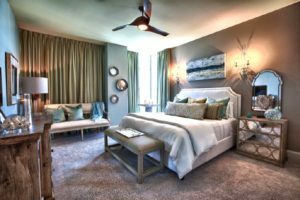 Designer: Cara McBroom; Written by: Carolyn Sanford Blue Sanctuary is located on the shore of the Emerald Coast. 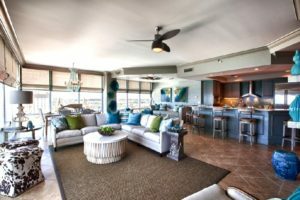 The colors of the coast are unified in the interior space with lively blues and greens amongst the plush, contemporary furniture. 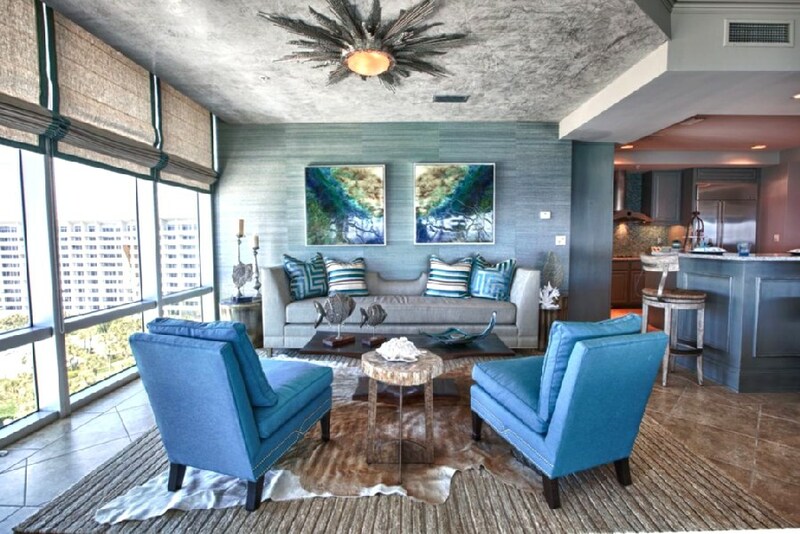 The wall covering and fabrics are bold color choices that resemble water while the rug and tile selection compliments sand. In this comfortable seating area your senses are stimulated by different patterns and textures. 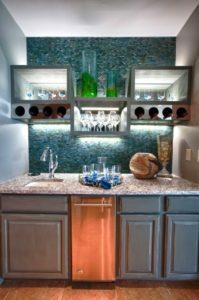 This bold wet bar is sure to be an eye catcher in any space. The rectangular shelves are an unexpected solution to traditional cabinets. Backlit shelves create rhythm and emphasis amongst this contemporary bar that provides an energy one would not expect to find. Again, careful selection of blue and green tiles makes the bar flow harmoniously with the emerald coast. Floor to ceiling windows provide adequate daylight so the chandeliers and light fixtures were able to have fun with and use as pieces of art. 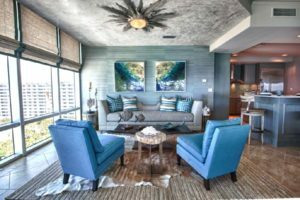 From sea glass chandeliers to bronze sunbursts the designer was able to bring in different selections of chandeliers and lights into Blue Sanctuary that compliment the Emerald Coast. Imaginary lines are created with the careful placement of furniture in this large open floor plan. The designer was able to space plan a dining room as well as two different living areas that all flow harmoniously together. Each bedroom is a variety of contrasting textures and finishes. 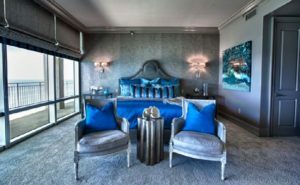 In this master bedroom the vibrant cobalt blues pop against the different variations of gray fabrics. From satin to velvet to wool, the textures are endless in this bedroom. 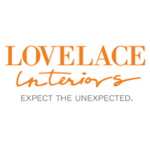 Space planning is an extremely important part of interior design. This designer was able to provide multiple forms of seating in each bedroom through careful space planning. The designer chose traditional pieces of furniture with a contemporary edge. Another creative design that was done in this bedroom is the use of faux blinds. The only windows in this bedroom are in the corner, so the designer continued the fabric onto the adjoined wall in order to create an impressive finish. Blue Sanctuary is located on the shore of the Emerald Coast. The colors of the coast are unified in the interior space with lively blues and greens amongst the plush, contemporary furniture.